Footage has appeared online showing a police officer helping an elderly man across the road by carrying him on his back. Talk about going above beyond the call of duty. 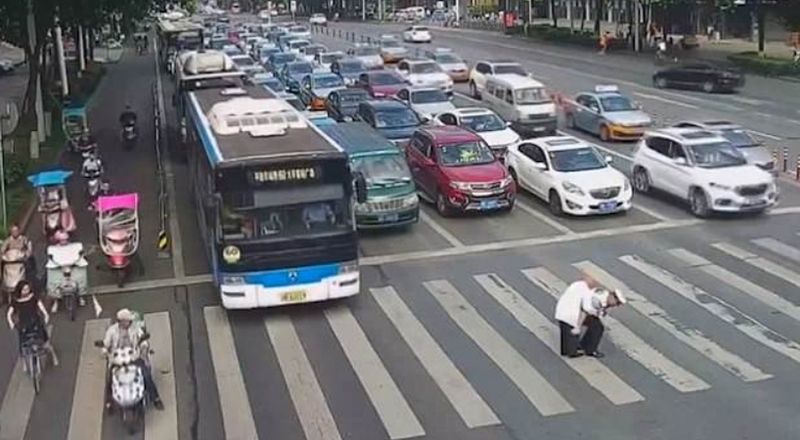 The heartwarming CCTV footage, filmed in south-west China, shows the man attempting to cross the road using two sticks, while some motorists continue to whizz past. Spotting the man struggling, traffic cop Qin Weijie decided to offer his assistance to the man. Lifting the man onto his back, Weijie helped him cross the road and safely deposited him on the other side. Nicely done. Speaking after the incident, according to quotes in the Daily Mail, Weijie said: “The road was quite busy, with a lot of cars. I was afraid that he (the elderly man) might feel unwell if I walked too fast. After the clip appeared on social media site Weibo it was flooded with comments from people praising the officer for his kind actions. I mean, I don’t know how much praise they should get for not deliberately ramming into a policeman and an old guy trying to cross a road, but sure, fair enough.